Chinese tourists are big spenders and with the numbers visiting Europe set to soar by nearly 70% over the next five years, their arrival is opening up opportunities for European companies. A total of 12.4 million Chinese, mostly in guided tour groups, came to Europe in 2017, according to the European Travel Commission (ETC). The Chinese Tourism Academy (CTA) is expecting the number to reach 20.8 million by 2022. “A few years ago, the Chinese came to Europe solely to do some shopping. Now, they’re increasingly keen to know the culture and the countryside,” Dai Bin, CTA President, said in Venice at the launch of the year of tourism between the European Union and China. “They want to have personal experiences and visit areas where they don’t see any other Chinese,” said Eduardo Santander, ETC’s Executive Director. “They like the cuisine, the music and the blue skies as most of them come from the coast, where pollution is extremely high,” Santander added. China is the world’s biggest source market for tourists, with 129 million holiday makers traveling abroad a year, accounting for one-fifth of the total number of tourists globally. Furthermore, they spend more than twice the amount that American tourists do – USD261 billion in 2016 compared with USD123 billion. Small gestures can go a long way toward making tourists from China feel more at ease in Europe, said Jacopo Sertoli, head of Welcome Chinese, a body that awards certificates to tourism companies catering for Chinese customers. “You can make them very happy by offering them a glass of hot water,” he said, noting most Chinese families drink water at that temperature rather than cold. Chinese language television stations and good Wi-Fi in hotel rooms are a good idea while payment methods favored by the Chinese, such as UnionPay, Alipay and WeChat Pay, are a must. CTA’s Dai said Europe should reduce the red tape for its Chinese visitors. “We hope Europe will make it easier for Chinese to get a visa,” he said. “In a number of eastern European countries, for example, it’s easy, but it’s very difficult in others. 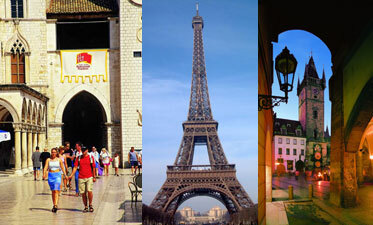 When Chinese tourists visit Europe, they want to visit several countries, not just one,” Dai said. China has already become more accommodating to foreign visitors. Most Europeans can stay in Beijing or Shanghai for 144 hours (6 days) without a visa. According to ETC data, France is the No. 1 desired destination in Europe for Chinese tourists, with 61% of visitors hoping to go there, followed by Germany with 37% and Italy with 28%. Travel to eastern Europe is booming, not least because of the easier allocation of visas and the increased availability of cheap flights, the Shanghai Daily reports. Mr. Jochum Haakma, Chairman of the EU-China Business Association (EUCBA) and Ms. Gwenn Sonck, Executive Director of EUCBA and of the Flanders-China Chamber of Commerce (FCCC) participated in the opening ceremony for the EU-China Tourism Year.